Biotechnology isn’t just about developing novel ‘wonder drugs’ or new medical treatments. Over recent decades it has come to play an increasingly important role in a wide range of things – and pest control is no exception. It’s not only terrorists and megalomaniac movie villains who threaten to indulge in a spot of biochemical warfare; the whole of nature’s at it too – and sometimes we can use that to our advantage when it comes to controlling pests. Some kinds of plants, for instance, generate particular chemicals when they are damaged, to incapacitate or repel whatever is attacking them – or even to attract the natural enemies of the pest. The potential for this kind of biotech pest control is, obviously, enormous and unsurprisingly there’s a huge amount of work going on around the world to investigate the way plants do this, and to try to harness it to protect crops and garden plants. One area where biochemical biotechnology is already particularly well established is in using pests’ own chemical signalling systems against them. Many plants and animals use natural messenger substances called semiochemicals to help control their development, growth and behaviour, and in particular, a large number of pest insects rely on one group of these chemicals in particular – pheromones. These are special ‘scents’ that broadcast information about a range of things to others of their kind – and most crucially, their readiness to breed. This has been used successfully in a range of pest control applications, and perhaps one of the best examples is the commercial production of an artificial pheromone – rejoicing in the chemical name methyl 2E,4Z-decadienoate. 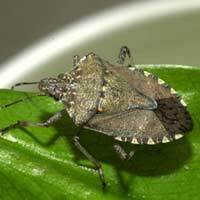 This chemical helps lure brown stink bugs (Euschistus) into traps by seeming to offer passing males the promise of waiting females, as well as encouraging the bugs’ natural predators to investigate the ready food source! There has even been talk of deploying similar pheromones for other insect species at the ports of entry to countries, to protect against the arrival of non-native pests. Work is currently ongoing in Britain to develop new innovative pesticides based on these powerful chemicals. If that all makes biotech pest control seem a bit remote, it really shouldn’t. It’s a fair bet that at least a few of the garden centres in your local area stock an example of one of the most successful domestic biotech pest products ever, and it’s something that’s aimed at the gardener’s number one foe – the slug! The whole thing relies on Phasmarhabditis hermaphrodita – a microscopic nematode worm that is watered into the soil and which invades the bodies of passing slugs, delivering them a fatal dose of a disease which only affects this kind of mollusc. The beauty of this approach is that it is very specific, and brings precision-targeted control to the garden, completely removing any danger of harm befalling innocent wildlife. It’s not a cheap solution to the problem, but used properly it can be uniquely effective, and similar treatments are now also available for vine weevils, in the form of two different nematode species Heterorhabditis megidis and Steinernema kraussei. Quite literally add the dried contents you buy in the garden centre to the appropriate amount of water, apply to the area you want to protect – and let biotech’s miniature army do the rest! Not all biotech pest control involves quite so much clever science. At its simplest, it can involve only slightly more actual technology than when gardeners enlist the help of nature’s ‘friendly’ creatures and encourage them to help in the fight against insect and other pests. In some cases, this may just be about working with what predators there naturally are, while in others, it may involve a bit of selective breeding to produce a useful animal – such as a domestic cat that is a better ‘mouser.’ At other times, it can be a question of artificially introducing one species into a place where it doesn’t normally occur, to deal with a local pest of some kind. This latter approach is not without its own dangers, however, as the well-know tale of Australia’s experience with the Cane Toad (Bufo marinus) shows. Introduced to a few parts of Northern Queensland in 1935 from its native Hawaii in an effort to control the ravages of the cane beetle, the 100 or so toads originally released have multiplied to over 200 million and now occupy tracts of the neighbouring states. With almost no natural predators in their new environment, and equipped with a powerful defensive poison to protect them, they have themselves become a pest. If the biotech approach appeals, it’s probably best to stick with the kind that comes with clear instructions printed on the packet!